We offer galvanized steel platforms and walkways that are used to support either shelters, cabinets or generators at permanent cell sites. Attached below are photos of our 3'x4' (left), 4'x5' (right), 8'x10' (below them) and 10'x10' (2 piece below the 8'x10') galvanized steel platforms equipped with drop leg jacks. The 10'x10' platform is built in two sections and bolted together on site to save in shipping, and also incluces the optional 1'x1' galvanized steel jack plates. 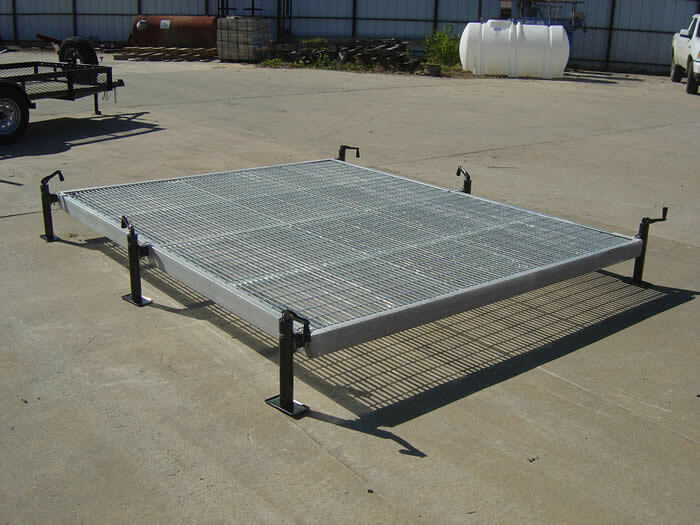 We can make these platforms in any size, typically rated for 2,000 lbs, but we can also upgrade them for a 4,000 lb rating. We can also provide galvanized platforms for permanent sites with hand rails.